The Cleaning Kit for Zenius, Primacy, Edikio Flex & Edikio Duplex from Evolis provides a simple cleaning solution for your card printer. 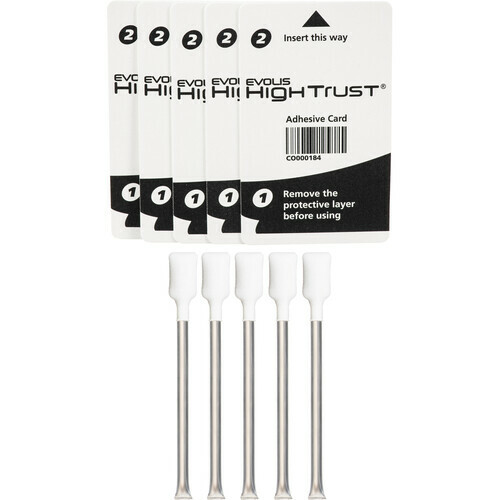 This kit comes with 5 pre-saturated adhesive cards and 5 swabs. The adhesive cards are designed to remove dirt from the cleaning rollers, while the swabs are well-suited to clean the print head. The use of this kit helps you keep your printer in good shape and prolong its lifespan. Box Dimensions (LxWxH) 4.6 x 2.7 x 1.4"